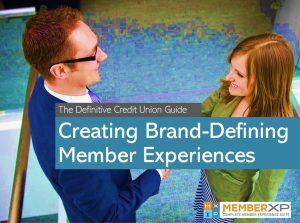 The Definitive Guide: How to create brand-defining credit union member experiences. Does the member experience at your credit union set you apart from the competition? Get this free step-by-step guide to creating an unsurpassed retail financial services experience at your credit union. Based on our work with hundreds of North American credit unions, this definitive guide provides best practices for creating and sustaining a best-in-class credit union member experience. I want to read this free eBook.